With Easter approaching I’ve been looking for some Easter table decor inspiration. After the long hard winter that many people have endured this year, it’s so uplifting to see traditional Easter table settings with all their color and pretty floral arrangements and even chicks and bunnies. 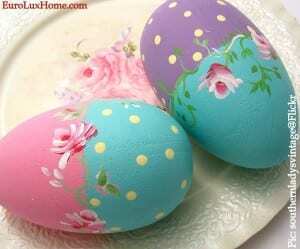 The design on these sweet hand-painted Easter eggs would be easy for anyone with an artistic eye to copy! They are larger wooden eggs, the ostrich size, and they are perfect to scatter across a tea table not just at Easter but for a wedding or mother’s day too. 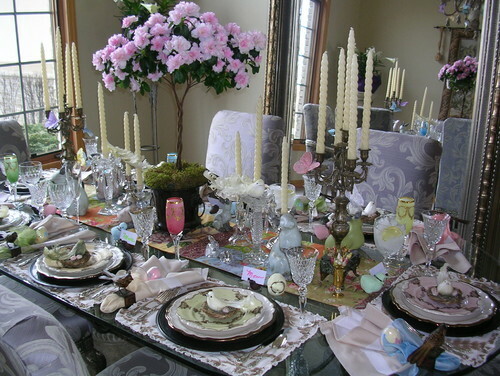 This Easter table setting looks very Victorian style to me. 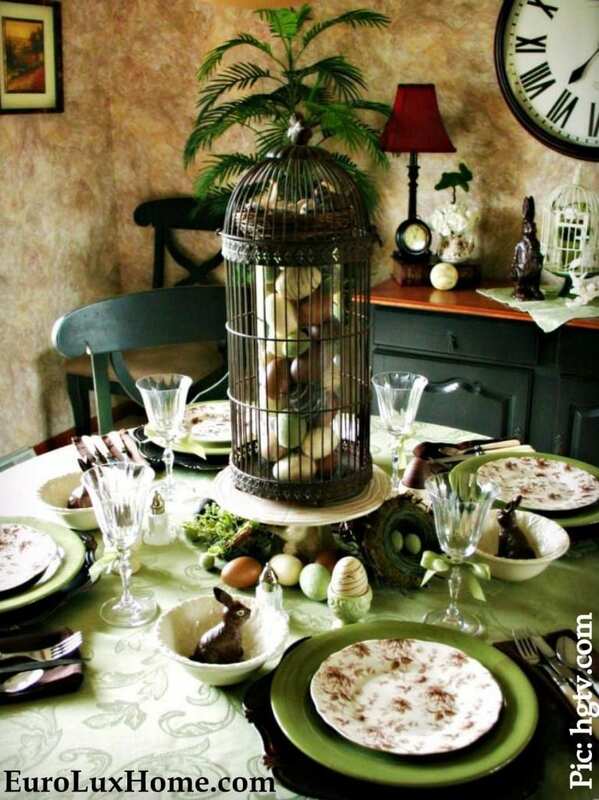 A tall glass vase (this is a hurricane vase) is filled with decorative faux eggs and then placed inside a vintage birdcage. More eggs and chocolate bunnies are sprinkled around the table. The green table cloth and plates, as well as the large palm plant in the back, add to the ‘natural’ backdrop. 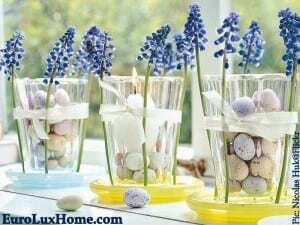 This is another simple and fresh Easter table setting that reminds us that spring is here! This look could also work well on a bathroom shelf or window sill or on a console table in a French Country bedroom. The glass tumblers are filled with pebble-sized fake eggs and the center glass has a candle too. Four sprigs of flowers are tied to each glass with a white ribbon, and each glass is placed on a colorful saucer or glass coaster. How easy is that? At the other extreme, here’s a lavish Easter table setting with every bell and whistle imaginable! We’ve got bunnies and eggs and butterflies and birds in nests and fancy cut crystal and decorative plates and placemats and ornate candelabra and twisting candles and big pink flowers and colored glasses and… It’s one of those brilliant designs that works because it is so over the top. If the designer had held back on a few things it could risk looking merely cluttered and fussy. 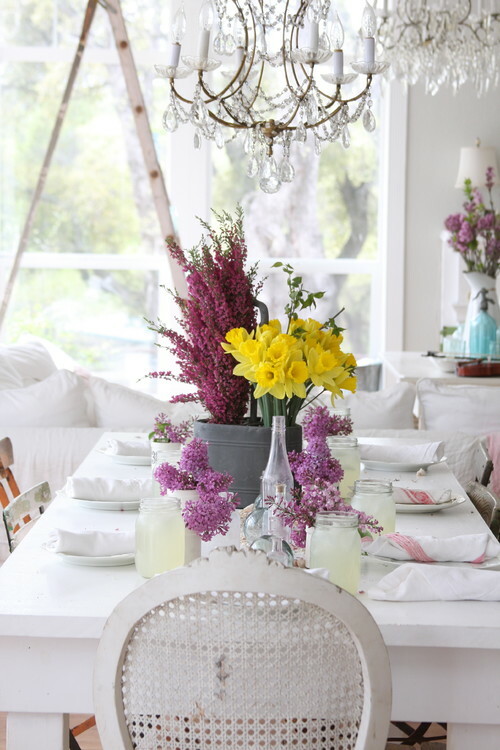 But they went ALL OUT with springtime exuberance, so the table looks whimsical and feminine and fun. 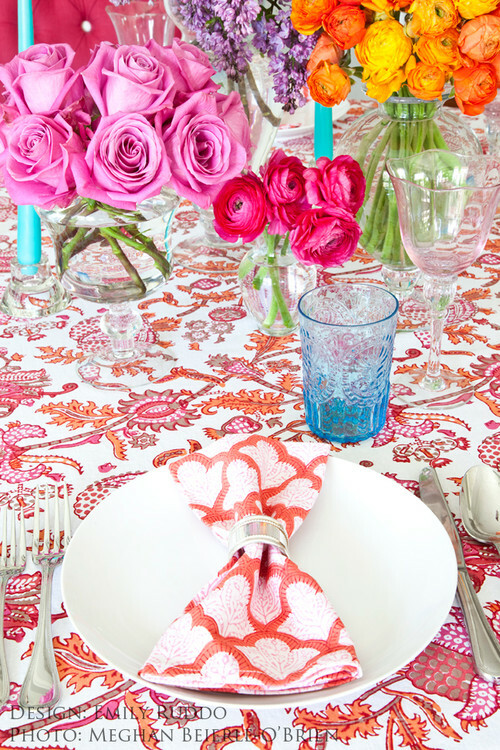 Along the same lines, this glamorous Easter table in Los Angeles celebrates with bright color and bold pattern. Who can go wrong with a riot of flowers? The table setting avoids looking too messy because each bouquet is a single color, taming the wildness with a tailored look. If you prefer a softer look, this Easter table also relies on flowers to create a charming springtime mood but everything else is kept very stripped down. A pure white table and bistro chairs are teamed with white linen napkins and humble Mason jars to create a dreamy-clean canvas so the daffodils and lilacs can star! Wispy chandeliers add to the delicate mood. 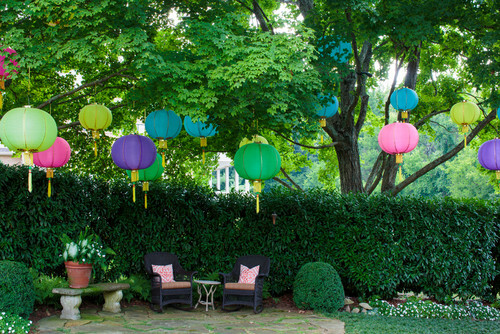 If you will have your Easter brunch or dinner outdoors, candy-colored Chinese lanterns keep the Easter feeling. They look a little like Easter eggs floating in the air and the pretty paper lanterns are usually easy to find in the Chinatown area of your town or online. I hope that these Easter table decorations have give you some ideas! And if you are looking for an Easter gift for yourself or a loved one, check out our vintage and antique religious treasures, from holy water fonts and Madonnas to crucifixes and standing crosses. This entry was posted in Entertaining, Holiday Fun and tagged creative home decorating, cut flowers, dining room, Easter, holiday decor, holiday decorating, holiday table, table setting on March 24, 2015 by admin.